Being Presbyterian means specifically that we govern our church through the leadership of a council of elders (called presbyters in ancient Koine Greek). 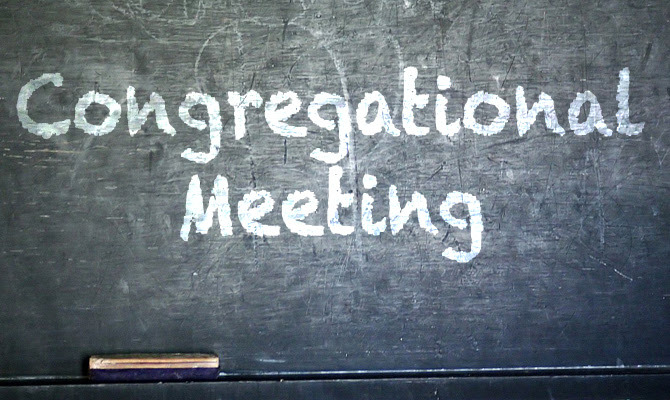 Our annual congregational meeting is the way in which we elect new officers (elders and deacons) as well as make decisions as a community regarding specific things such as the call of any pastor(s). This is being presbyterian at its best. Our meeting should last for roughly 30 minutes. Please pray for the Lord’s wisdom to rest upon our church leadership. After the meeting we’re gathering together for a potluck lunch. Bring a dish to share and come ready to get to know someone better, enjoy a laugh with old friends, and quite possibly to try something you’ve never eaten before! We’ll gather for lunch downstairs in the Light House Room after the Congregational Meeting, approximately at 12:20pm. This entry was posted on January 23, 2014 by Monte McClain in Uncategorized.